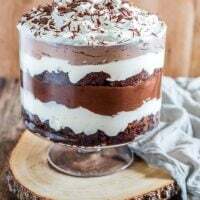 You might wanna skip dinner and go straight to dessert, because this Brownie Trifle is the type of dessert that demands your immediate attention. And although it looks massive and impressive, it won’t stress you out because it is very easy to put together. Pinky promise! YOU GUYS! This Brownie Trifle? ??? I just can’t stop eating it. I knew it was going to be legendary, but it exceeded all my expectations. I was hoping assuming that my husband – who doesn’t have much of a sweet tooth – would eat a few spoons of it and that’s all. Gosh, this whole past weekend, every time I laid eyes on that man, he had a bowl on his hands. If his obsession is any indication, this Brownie Trifle just ranked among one of the best desserts ever in our household. And I’m pretty confident you will think the same! The idea for this brownie trifle came from my favorite dessert: Brazilian Pavê. It is my grandmother’s signature dessert and I could live off that thing. Yes, I would be 500 pounds, but it would be so worth it! But the thing is: it was almost 100 degrees here this weekend. Hot, hot, hot! And I wasn’t going to sweat my belly in the stove making Creme Patisserie. So I decided my trifle would involve brownies, whipped cream and chocolate pudding, because most of these things need no heat. You do need your oven for the brownies, but all is good because we are simplifying the whole process by using Nestle Toll House Baking Mix. I don’t usually use baking mixes, because most of the time I can make something better from scratch. That being said, this is Nestle and they have over 75 years of baking experience, which is more than twice my age. Therefore, if there’s a brand I can trust with my eyes closed, it’s this one! And now they have a new product line that it’s not only premium but also highly versatile and without any artificial flavors or colors. There’s so many possibilities of what you could make with these mixes, including twists on your favorite classics. The brownies were fudgy, chocolaty and so addicting! I literally had a hard time not eating the whole thing as I was cutting them to add to the trifle bowl. But I was strong and only ate like 3 brownies. ? Most of them made their way into this amazing dessert! So, hang in there. Don’t eat all the brownies! It will be all worth it in the end. I have faith in you. Once the brownies have made their way into the bowl, all that’s left to do is top them with whipped cream, then chocolate pudding, more brownies, more whipped cream and more chocolate pudding. I finish everything off with a beautiful layer of whipped cream and some chocolate shavings to decorate! If it wouldn’t be so hot here, I might have made a fudge sauce to go over everything. The beauty of this dessert is that you can easily customize it to your preferences. If you like peanut butter cups, throw some in there. If you like toffee, go for it! Wanna add some Baileys to the pudding and/or the whipped cream? I say do it! Whatever makes sense to make this the best dessert you have ever created. Preheat oven to 325F degrees. 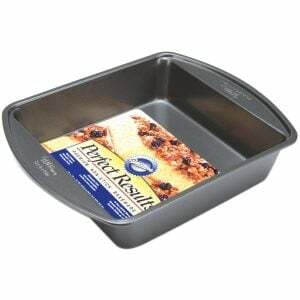 Spray two 8-inch-square baking pan with cooking spray. Stir brownie mix, egg, oil and water in a large bowl until blended. Stir in 2/3 cup of the morsels. Spread batter evenly into prepared pan. Bake for 10 minutes, remove from oven and carefully sprinkle remaining 1/3 cup morsels on op of batter. Bake an additional 20 to 25 minutes or until wooden pick inserted near center comes out clean. Cool completely on wire rack before cutting. Pour 4 cups of cold milk into a large bowl. 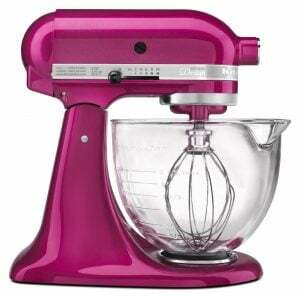 Add mix and beat with a whisk or electric mixer for 2 to 5 minutes or until set. Refrigerate until ready to assemble trifle. Place the sugar, heavy cream and vanilla extract into a mixing bowl and whisk (or mix with the aid of a stand or electric mixer) just until the cream reaches stiff peaks. Reserve. 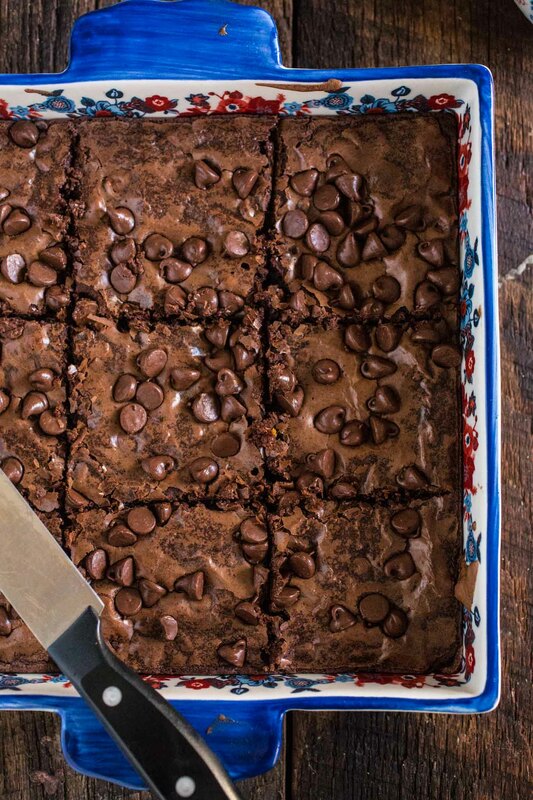 Cut the brownie into small squares. In a large dessert bowl, add a layer of brownies, whipped cream, and chocolate pudding. Repeat with another layer of brownies, whipped cream, and chocolate pudding. Finish off with whipped cream and sprinkle some chocolate shavings. 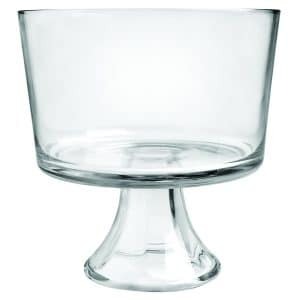 - This dessert can be easily adapted to different dessert bowl sizes. You can even make individual trifles! Just make even layers of brownies, whipped cream and chocolate pudding. - PREP AHEAD - You can make this trifle a day ahead and store in the fridge until ready to serve! 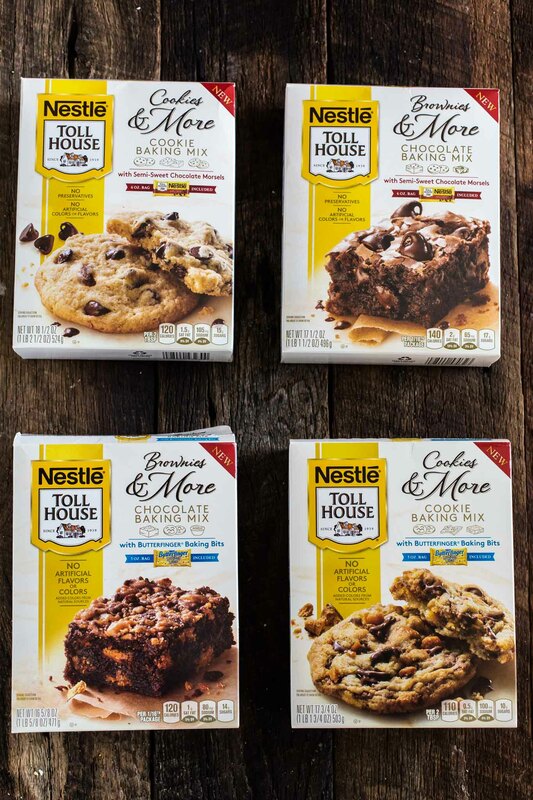 There are so many things you can make with Nestle Tollhouse baking mixes! 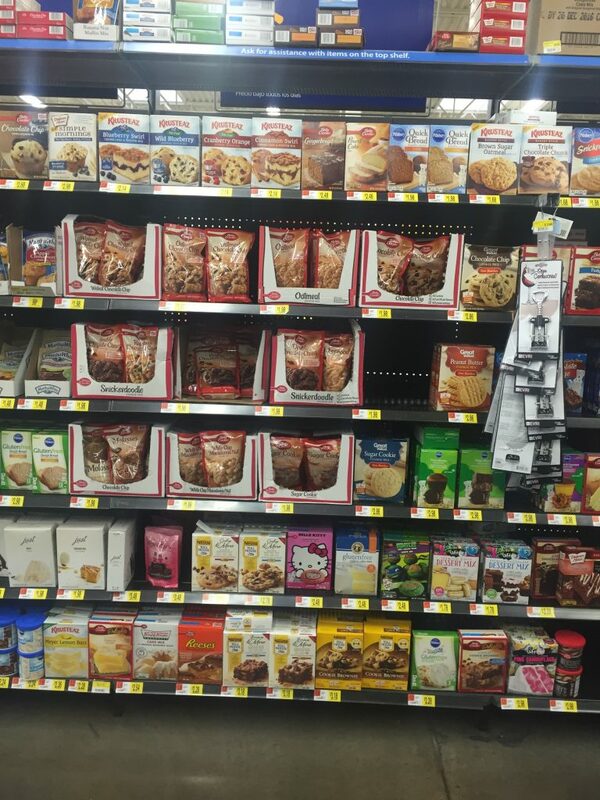 So head over to your local Walmart and grab a few boxes. Be sure to follow them on Twitter, Instagram, Pinterest, Facebook and/or Youtube for some amazing baking inspirations! Loved reading your post and I’m a big fan of fudgy brownies. Will try the recipe. 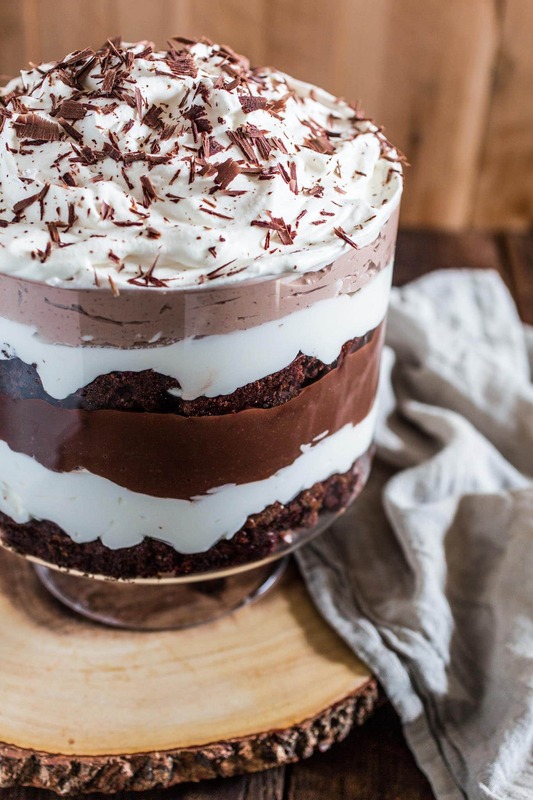 This brownie trifle looks so delicious! Any way you slice them you can’t go wrong with brownies for dessert! This would be sure to impress at any party!! When it looks this good, I would totally skip dinner and go straight for dessert ;) (and then have more dessert after my dessert, lol). Wow, all those layers….looks so creamy and dreamy. All I’d need is a big spoon and way to go! What a showstopper! Such a fun dessert! A total crowd pleaser for sure! 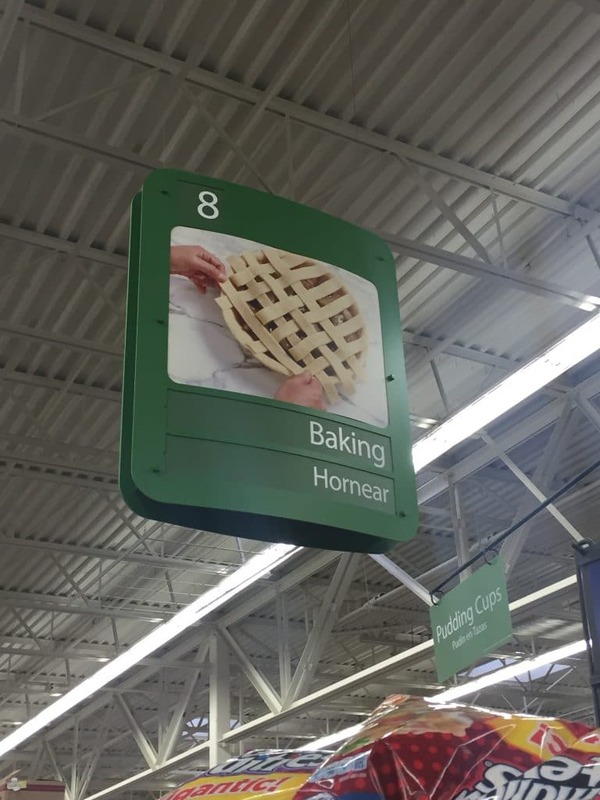 Oh, now this sounds like my kind of dessert! Those brownies alone look amazing, and I might have eaten 4-5 on the way to the trifle bowl. Good thing I wasn’t around when you made this one or else our trifle would have just been whipped cream + pudding! Thanks for starting my morning off with this gorgeous treat! OMG! 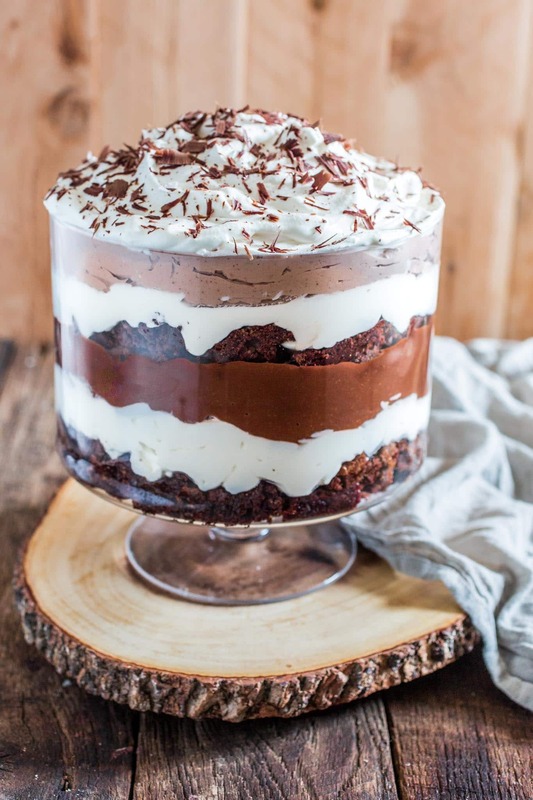 If this brownie trifle was in my house I would totally skip dinner and go straight for dessert! I’m loving all those chocolate chips in the brownies! Pinned! You’re killing me. That’s all I’ll say on this one. Wow! Everything about this brownie trifle is so good! I mean we’re talking about chocolate brownies and chocolate pidding AND WHIPPED CREAM! So good I can have the whole thing myself! What is the top chocolate layer? It looks like Mousse but that isn’t in your recipe. Is the photo a different recipe? Hi Tara, the top chocolate layer is chocolate pudding. I ran out of milk and had to make it with heavy cream, hence why the different color! :) Good catch! I think I will make this for an upcoming party for my neighborhood. Wondering if you assemble it ahead of time-even if it’s a day ahead of time-would it get soggy? Hi Annie, I hope you like it! :) Let me know how it goes. Happy Thanksgiving! How many servings in this brownie trifle recipe? I’m making for 300 people. You can serve around 20 people with this! Even more if there are other desserts being served. Did any one make this???? I would love to hear some feed back on how it tasted INSTEAD of looks good or yummy. I’ve been making this recipe for 12+ years, it is very delicious. My 30 yr. old son just requested it for his birthday dessert. I am thinking about adding mint extract in the whipped cream and a drop or 2 of green foodcoloring for a mint chocolate vibe. But would I omit the vanilla in the whipped cream or use the mint extract in addition to the vanilla? My whipped cream turned out way too runny. :( any idea what went wrong? Thanks! I made this for a Valentine’s Day potluck at work today. Everyone raved about how good it was. Several people went back for seconds and thirds. A few people commented that they wish they could have eaten the entire bowl of it. I made it exactly as you have it written, using the same Nestle Toll House Brownie mix and other ingredients that you mentioned. It was easy and delicious! I made everything yesterday, cut the brownies and shaved the chocolate last night, refrigerated the pudding and whipped cream overnight and then layered everything in the trifle bowl this morning. It was quick and easy to put it together with everything ready to go. Thank you for a great recipe! This went down a treat on a girls’ night! Such an easy recipe, and very lovely. Probably not one if you’ve got to drive afterwards though! This may be a dumb question but since you did two boxes of brownies did you cook two pans of brownies or just one really thick pan? I’m just wondering how this is gluten-free (as you keyed) since the brownie mix contains wheat and barley flour. Am I missing something? Hi Maria Isabella, I had to read the whole post again, as I wrote it over a year ago, but couldn’t find where I keyed it as gluten free (as it’s not!). You can certainly make it gluten free by making your own gluten free brownies though. I hope that helps! My mom makes something similar and she adds in a package of Heath bar crumbles on top of the layers of whipped cream and as garnish on top instead of chocolate shavings. Adds a yummy crunch! One of my all time favorite desserts!! Trifle in English cuisine is a dessert made withfruit, a thin layer of sponge fingers or sponge cakesoaked in sherry or another fortified wine, andcustard. It can be topped with whipped cream. The fruit and sponge layers are suspended in fruit-flavoured jelly, and these ingredients are usually arranged to produce three or four layers. 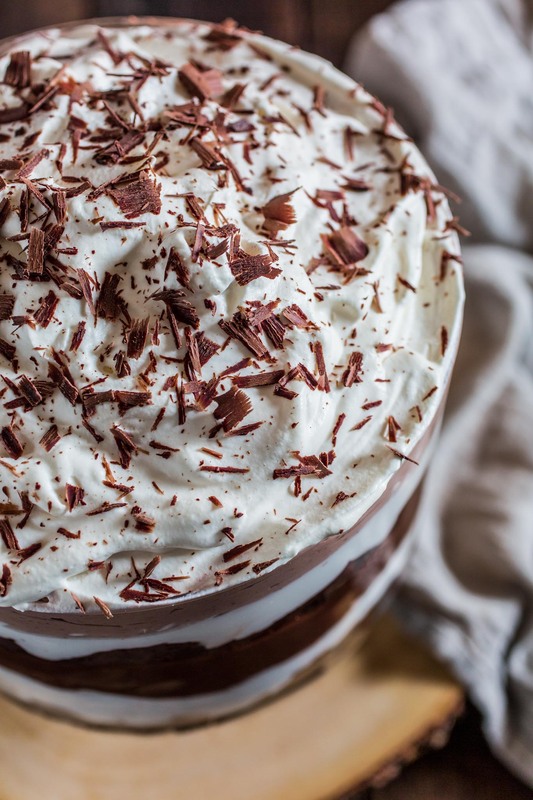 The contents of a trifle are highly variable; many varieties exist, some foregoing fruit entirely and instead using other ingredients such as chocolate,coffee or vanilla. Hi what if I want to make the pudding and brownies from scratch. Do you have their recipe? Thanks for sharing! I am glad to hear that it can be made ahead of time! I have been making this for years, though I call it Death by Chocolate. Everyone always loves it! My version has heath bars crumbled between layers or other candy. However, for anyone thinking of making this, you should use cook and serve pudding, not instant. I got instant by mistake once and it just wasn’t as good. Also, if you’re thinking of substituting cool whip for the whipped cream, don’t. I’ve had one like that and it was just ok.
I’m going to try to make this but I keep thinking the whipped cream is going to be absorbed into the brownies or into the pudding? Did anyone have this problem? Yes, I’m not sure what I did wrong but the whipped cream was too runny and mixed with the pudding. I didn’t get that nice layered look. Thank you! Made this for my office bake-off competition and won first prize 👍🎉. 1 addition I did was strawberries. That’s so cool, Sowjanya! Congratulations! I’m glad it was a success! I want to make this but does the whipped cream hold up or become thin and runny after sitting? Thank you. Hi Marla! Are you planning on assembling ahead of time? If yes, I would assemble the trifle but save the top layer of whipped cream to be added when you serve it. I hope that helps! I am thinking of making 240 individual cups of these for a church dinner. I am wondering if whip cream in the can can be substituted? It would make the assembling of this many servings so much easier. Hi, since this recipe calls for 2 boxes of brownie mix, what size trifle bowl did you use? I see so many sizes at the store, not sure which size would work for this recipe?